My monastic journey began 6 years ago when I visited the Guest House in Glencairn for the first time to see if Cistercian life was the answer to this restless search for a more meaningful way of life. I was both surprised and alarmed to be experiencing God’s call at this mature stage of my life. My formative years were influential in my decision. I was born and raised in a traditionally happy Catholic family of seven in the Conemara Gaeltacht where there was a particular blessing and prayer for every occasion. My parents communicated God’s life giving presence to us in the ordinary daily events of our lives and I experienced their love and support throughout my childhood. My earliest memory was listening to the consoling rhythm of the recitation of the family rosary as I slept in my cot at night. Even in those early years I loved to wander on my own to explore and enjoy the sounds and mysteries of nature which is recreated somewhat here in Glencairn. I was educated by the Sisters of Mercy who nurtured my faith with their emphasis on Christian living. I reluctantly left the comfort and security of home for Dublin at age 17 to begin a career in banking. I adapted well to city life and loved all it had to offer. I became immersed in sports and social activities and if God was calling me at this time I was too preoccupied to listen. I was also involved in different voluntary works and in the 80’s I took a career break to work as a lay missionary in South Africa for over two years with the organisation Viatores Christi. These were turbulent times in South Africa when the Apartheid regime was in force and the experience of living in a culture of prejudice, fear and inequality transformed my life. It showed me that true happiness and fulfilment is not attained by materialism and achievements but by a living relationship with God. I returned home a changed person and although I did not feel at that stage any attraction to religious life, my life became more centred in God and the things of God. I was more conscious of the aggressive individualism in our society, the vulnerability of our earth and the lack of respect for human life. When my mother died in 2000 I became more restless with a thirst for the divine and for spiritual things. I yearned to have more time with God and for God and for the first time I started to respond to this irresistible call deep within me. But why would I want to change direction at this late stage of my life? I lived a comfortable life with a well paid job and with family and friends who loved me. My long term plan was to take early retirement, sell my house and travel, before settling down to a peaceful life in my home in Conemara…but, God had another plan for me! I knew that the only way to my hearts desire was to renounce my former way of life and to give myself unsparingly to God. It was difficult to articulate this to my family and friends and I took some time out with my cousin, a Sacred Hearts sister in the Philippines, to discern if I should become a contemplative or a missionary sister. The longing for interior solitude, to be dependent on no one but God alone and to get to know him more in a serene and tranquil place led me to Glencairn and to this vibrant community with a diversity of cultures, ages and temperaments, from the fun loving younger members to the wise and tolerant older members. I am now happy preparing for my final vows next June 2010. All throughout my life I experienced the love and the care and the goodness of God and I want to repay this goodness by becoming a witness and a channel of His grace. 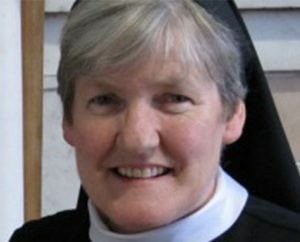 Sister Mairead made her Solemn Profession of Vows in June 2010 and continues to follow the paths of the Lord in the monastic life at St Mary’s Abbey, Glencairn today.